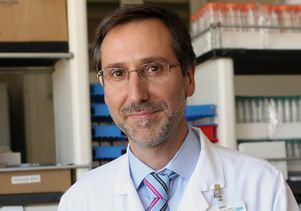 Dr. Antoni Ribas, director of the tumor immunology program at UCLA’s Jonsson Comprehensive Cancer Center, has been awarded the sixth American Association of Cancer Research-Cancer Research Institute Lloyd J. Old Award in Cancer Immunology. The award recognizes scientists for their research in cancer immunology that has had a far-reaching impact on the cancer field. Ribas, who is a professor of medicine in the David Geffen School of Medicine at UCLA, will be honored with the award during the association’s annual meeting to be held April 14–18 in Chicago. Ribas is being recognized for his leadership in the development of new cancer immunotherapies that are changing how people with cancer are being treated. His research has been aimed at gaining a better understanding of how the immune system can be effectively used to fight cancer in order to develop more effective and less toxic therapies for people with melanoma. He led the clinical program that demonstrated the effectiveness of the drug pembrolizumab, which has been a significant advancement in the treatment of melanoma by turning on the immune system to fight the deadly cancer. This was the first of the class of PD-1 blocking antibodies approved by the U.S. Food and Drug Administration for the treatment of any cancer. Furthermore, Ribas’ laboratory research has allowed defining mechanisms that lead to response and resistance to this class of new drugs. Ribas is also the director of the Parker Institute for Cancer Immunotherapy Center at UCLA, which brings together the nation’s leading cancer centers to develop new immunotherapies for metastatic disease. The consortium’s aim is to maximize the potential of cancer immunotherapy research by building strong collaborations between researchers, nonprofits and the industry, who are all working together to get new treatments to patients faster. The Lloyd J. Old Award was established to honor the memory of the late Lloyd J. Old, who was internationally recognized as one of the founders and standard-bearers of the field of cancer immunology.